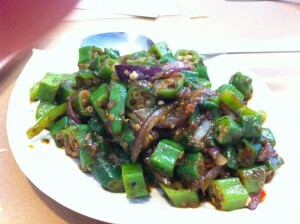 The owners of Red Hot Wok have opened another restaurant, Mango Garden in Cupertino. 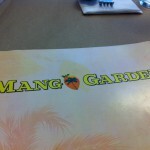 We actually stumbled upon Mango Garden because Theresa called Red Hot Wok asking for Oliver or Dominic, and was told “they are at the new restaurant”. 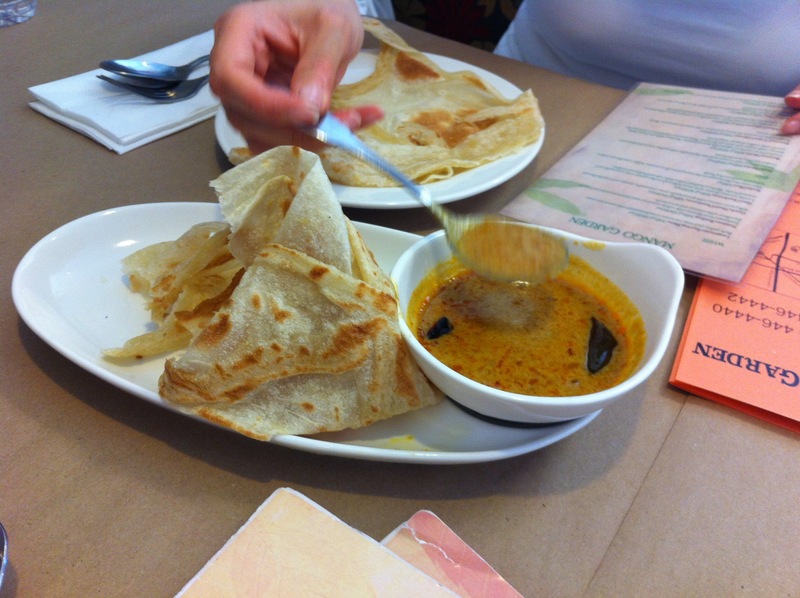 We were very eager to try it, especially since the cuisine is Singaporean. Equally exciting was they carried over their “snow” desserts from RHW, which we really enjoyed. 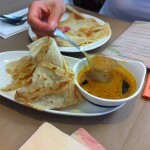 We started off with Roti Prada and Chicken and Beef Satay. 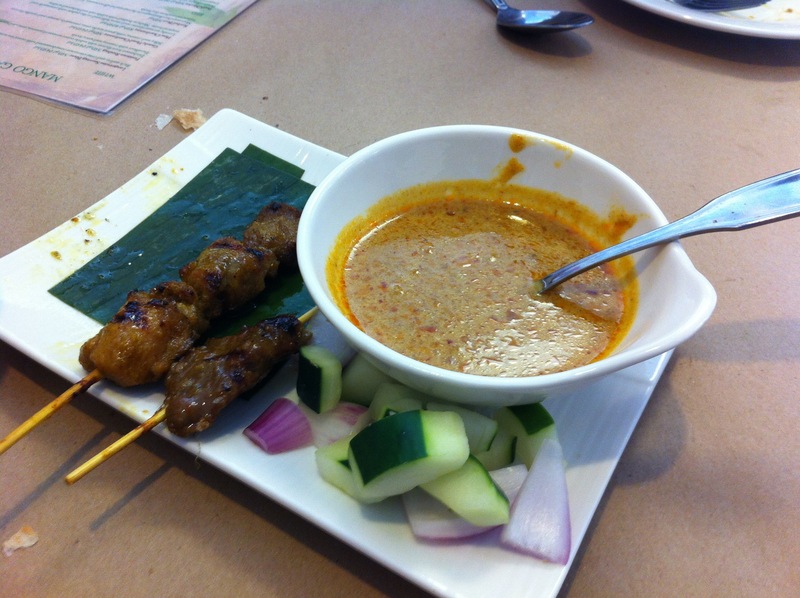 Both came with a curry dipping sauce. The roti was nicely made, slightly sweet, which complimented the spicy curry well. Satay chicken and beef were tender and flavorful. 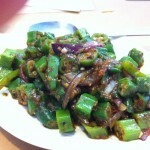 Belachan is a shrimp paste/sauce used in Singaporean cuisine and often serves as a seasoning agent and stir fry sauce for vegetables and meats. The okra did not have the typical “slime” you associate with okra, but the dish was a little wetter than previous versions I have had before. My personal preference is to have it a bit drier, but most people will like this dish. 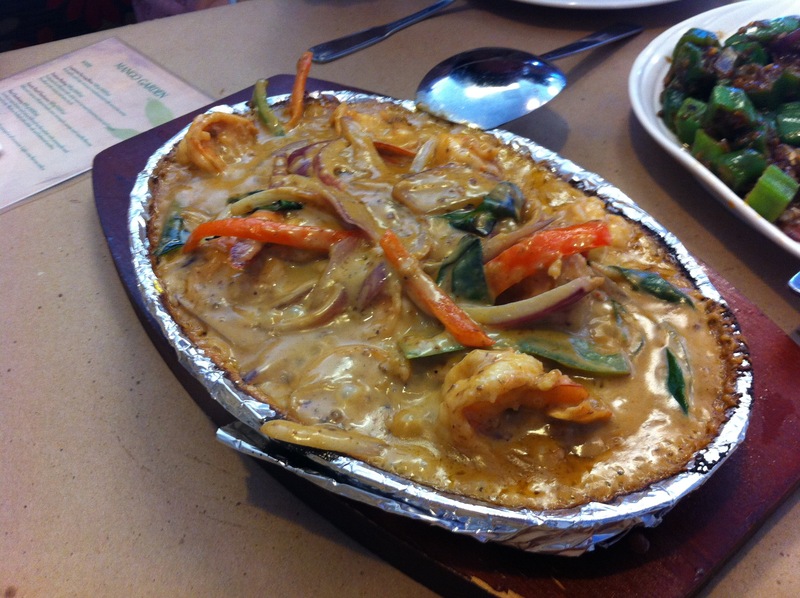 Brought to your table on a black hot plate, Sizzling Penang Prawns come in a creamy sauce with onions, peppers, and in this case curry leaves. You can really taste the buttery goodness, and the sauce is really good over rice, so make sure to get a bowl or two. 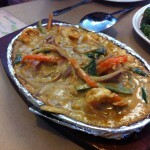 Siam Salmon- Spicy/sweet sauce with mango. Oliver made a suggestion for the crab, which is not on the menu, a mix of their sambal and special curry. 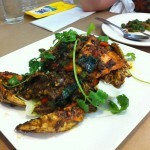 The sauce clung to the crab similar to the way a dry rub clings to ribs, which is a good thing. 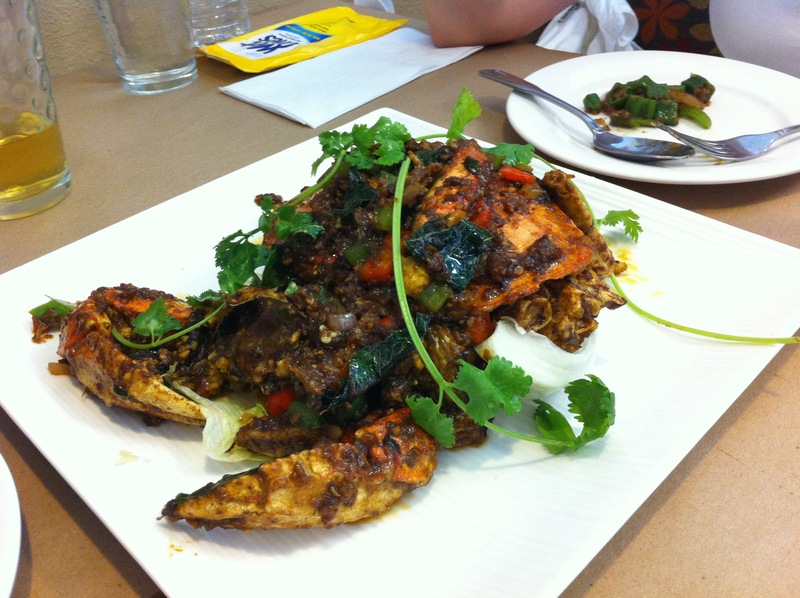 While I am not the biggest crab fan, Theresa and her cousin are, and they were all over this one. 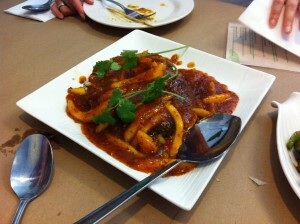 The sauce was very tasty, and and goes well with rice. 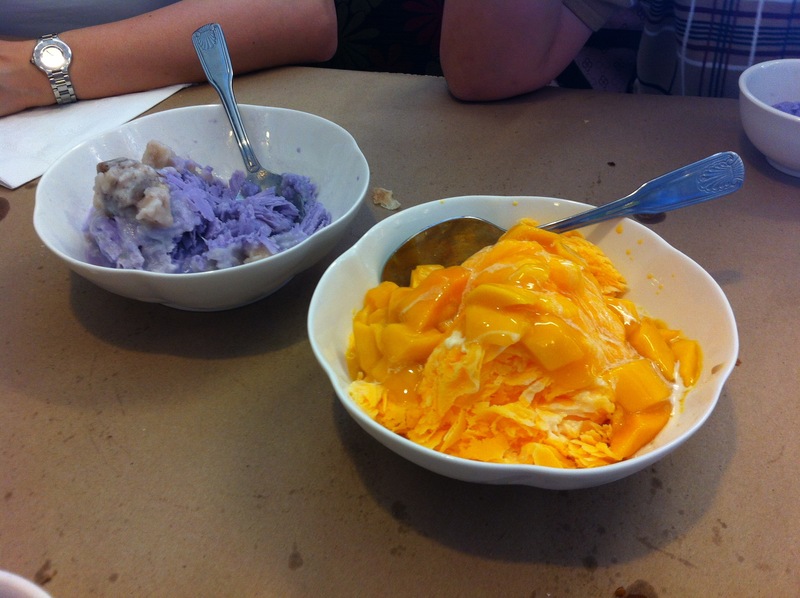 Will definitely have to try the other flavors on our next trip. 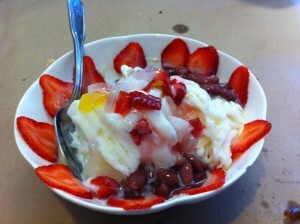 Milk Snow with strawberries, sweet red beans and coconut jelly. 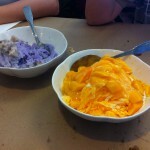 The dessert is a carry over from their other restaurant, Red Hot Wok. 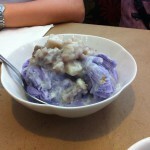 It’s a “snow ice”, which is basically like Italian shaved ice. The mixture consisting of ingredients similar to sorbet or ice milk are frozen in a block and then run across a blade to create shavings. 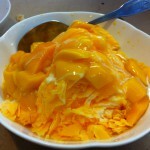 This creates a fluffy textured dessert. This is then topped with fresh fruit. My table mates were the most excited about this part of the meal, especially since it was a rip roaring hot day in the South Bay. 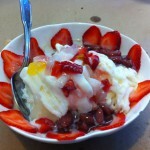 Rarely do I cite a dessert as the must have dish when you go to a restaurant, but this is one of those instance. Save room, as this is worth it. 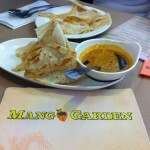 Mango Garden will definitely be on the regular rotations of restaurants we dine at. 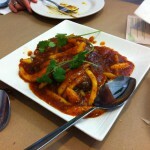 Lots of choices, and great take on Singaporean food. If that was not enough, it has the snow desserts that we crave. 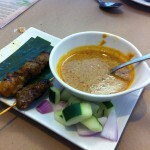 Would highly recommend it for fans of Singaporean food and a great addition to the Cupertino area.